Thats the point of an ambush... if you can't take your enemy head on, you use a surprise attack. Striking the Battlestars with their fighters still in the hangers. Deepcrush wrote: Thats the point of an ambush... if you can't take your enemy head on, you use a surprise attack. Striking the Battlestars with their fighters still in the hangers. Indeed. However, while the Atlantia did get caught out, and was destroyed before she could launch, this was not the case with the other Battlestars. As I pointed out, Athena's running tally of returning Vipers indicated that fewer than half were Galactica's own. Ergo, the Cylons were not engaging defenceless ships, but ships that had been caught on the hop but were nevertheless still able to launch. I wouldn't be surprised if they were operating a CAP. Which would also explain the low numbers of survivors. Deepcrush wrote: I wouldn't be surprised if they were operating a CAP. The President (at Baltar's urging) explicitly prohibited standing CAPs, on the grounds that it might lead to a firefight. Face it - the only way a Battlestar can go head-to-head with a Basestar with a decent chance of winning is if it obtains a position of superiority before the two engage. Captain Seafort wrote: The President (at Baltar's urging) explicitly prohibited standing CAPs, on the grounds that it might lead to a firefight. The president of the colonies... declares no CAPs... source. Captain Seafort wrote: Face it - the only way a Battlestar can go head-to-head with a Basestar with a decent chance of winning is if it obtains a position of superiority before the two engage. As in superior fighters and pilots and weapons. Already knew that, been pointing to that all along. Deepcrush wrote: The president of the colonies... declares no CAPs... source. Saga of a Star World, aka the original BSG film. Don't forget that in the original, Battlestar commanders weren't just naval officers, but senior political figures as well - the President was also Flag Officer Commanding the armistice fleet, and commander of the Atlantia. As in drawing the Basestar's fighters away or crippling their sensors beforehand. Captain Seafort wrote: As in drawing the Basestar's fighters away or crippling their sensors beforehand. Thank you for repeating yet again what we knew already for no reason what-so-ever yet again. Captain Seafort wrote: Saga of a Star World, aka the original BSG film. Don't forget that in the original, Battlestar commanders weren't just naval officers, but senior political figures as well - the President was also Flag Officer Commanding the armistice fleet, and commander of the Atlantia. In fact I have forgotten which is why I asked for the source that I'm still waiting for. Deepcrush wrote: In fact I have forgotten which is why I asked for the source that I'm still waiting for. A quote or a youtube clip... not your word on it. So you're trying to conduct a debate about a series you evidently know little about, to the extent of being ignorant of key plot points of the most well-known and widely distributed episode of that series. You're stating something and when asked for evidence of it you get pissy. How about you abide to your own sig dipshit. Last edited by Captain Seafort on Thu May 26, 2011 1:55 pm, edited 1 time in total. Reason: How about you abide by the rules regarding text colours. #1 - You asked for his source, he provided it, and you then said it wasn't valid because you didn't believe him. #2 - WTF does any of that have to do with his signature? His word isn't a source. Deepcrush wrote: His word isn't a source. Granted; but even though you disagree with him, do you have reason to believe that he's lying about the source he cited? When I mentioned what the SW Sourcebook said about the CR90, nobody said that I was lying and should provide a scan of the page. 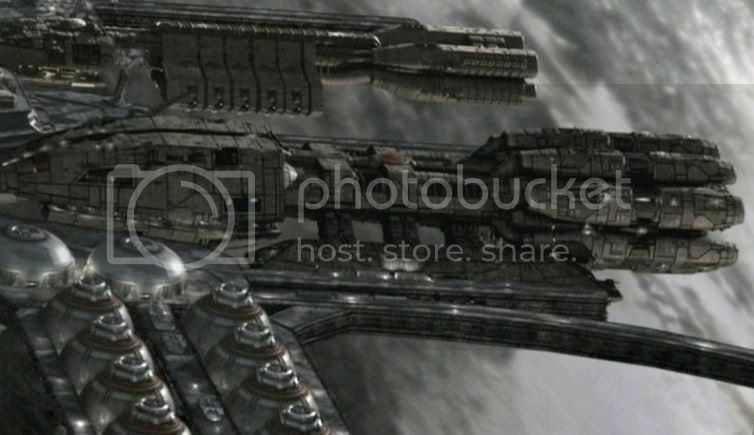 Regarding the exposure and vulnerability of the bays on Battlestars: I was poking around online, and found the following pic from TRS: "Razor." Check out the ship in the background, starboard of the Pegasus. It certainly seems smaller than the Pegasus, and has fewer engines/thrusters; but the side bits are certainly more well-integrated into the structure than the bays on a Battlestar. However, they don't look like launching/recovery bays. Anyone have any info on this class, or recall seeing anything similar?